If 2 was company, and 3 was a crowd, then 4 has to be in a class all of its own, and it is. The long awaited follow up to Bungie’s Halo 3 was delivered to Xbox 360 owner’s everywhere on November 6, 2012 by Microsoft owned 343 Industries. Since that day, I personally have collected thousands of kills (and deaths) in pursuit of continuing fun that has placed me on either Red or Blue team, or dusting the ice crystals of the Master Chief’s helmet for another dive into a compelling campaign. No spoilers. That is my promise to those of you who haven’t played Halo 4 yet. For the rest of you who have completed the campaign: you probably know everything I’m about to say. The Halo 4 campaign picks up four years after the final events of Halo 3 with the Master Chief adrift on the Forward Unto Dawn. As the Dawn drifts towards an unidentified planet, a strange scan passes over the ship and Cortana, Chief’s long time AI companion, makes the decision to revive him. From the moment that you exit the cryopod after the usual look at these four lights to calibrate your settings, you step out and see how good everything looks. The Master Chief has gone through some aesthetic changes that have been regarded as “firmware upgrades” which can also explain the use of new armor abilities further in the campaign. In an attempt to keep my promise, I won’t reveal the major plot points of the story, but I can tell you that if you have played for the story that Bungie started back in 2001, rest assured that 343’s continuation of the Master Chief’s story is just as engaging as its predecessors if not more so. 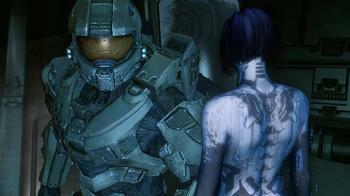 The connection between the Chief and Cortana that has been established for the past three games grows deeper and more meaningful in each mission the game. If you didn’t feel for these two before, you will now. The campaign does what it should. It reintroduces players to our protagonists and pushes them through new challenges and at all times border on insurmountable, which must be a very large problem considering what has happened in the past three Halo installments. Events we’ve waited for happen, and some are surprising if not terrifying. Part of what makes experiences more terrifying is how good this game looks. The cinematics look beautiful. Almost as beautiful as they made Cortana look for this installment. If you haven’t seen this game in high def, you should as soon as you can because everything looks like eye candy. My grade: Just play it! It was incredible! While it appears that the mentality of many developers has been “if it ain’t broke, don’t fix it,” 343 industries have modified Halo’s multiplier experience that when working at its best feels like a more fluid experience than the past. At its worst, the experience can be frustrating enough to stop playing, but here’s the catch: that doesn’t happen very often. Matchmaking now features a drop-in, drop-out style that those who are familiar with rival Call of Duty will recognize. While some say this is takes away from the overall “Halo-ness” of the game, players that have the bad luck of quitters and betrayers for teammates can now rejoice. You won’t have to fight the entire enemy team by your lonesome. Assuming you have teammates with you, and if they’re ever like mine, they will die. Do not go looking for the familiar red X though. If you or your teammates buy the farm, the X will no longer appear above your final resting place. You’ll either have to formulate some call outs of your own or hope you can see it on the radar of your HUD. While minor, it was something you used to know was always in Halo. Don’t fret though. It’s not changes that some call bad. New armor abilities including Promethean vision, hardlight shield, and thuster pack, are just a few additional armor abilities that help to add a little spice to Halo formula. Similar to the way they have worked in Halo: Reach, armor abilities allow the user a reusable power, unique to their loadout. The idea of the loadout options is nothing new to FPS veterans as it is present in most of Halo’s shooter brethren. Players are no longer restricted to the classic Assault Rifle or DMR starting weapons. As players progress through higher ranks, they will unlock Spartan Points which can be used to unlock primary and secondary weapons as well as grenades, armor abilities, support upgrades, and weapon skins. All of this brings us to one of 343’s newest additions. You’re special. Don’t let anyone tell you otherwise. Back in the old days of Halo, players would have to suit up in the Chief’s Mark V armor in Halo: CE or his Mark VI in Halo 2. In Halo 3 and Halo: Reach, Bungie introduced armor permutations allowing Spartans to do more than switch their colors. They could now switch everything from leg armor to chest pieces to helmets, etc. In Halo 4, 343 continues this tradition as well as implementing specializations that allow for more customization of your Spartan avatar via support upgrades. After reaching SR-50, players have the choice of starting a new specialization that will unlock new armor variants and at the end of the ten level stretch, a new support upgrade than can be equipped on a loadout. From then on, every ten levels, players will have the ability to gain new armor and new upgrades than can change the multiplayer experience. This is a nice break from what Halo purists may be used to, but these additions keep the game from feeling stale. Another exciting option that 343 has given players is essentially a second campaign. This second campaign replaces the Firefight mode that first appeared in Halo 3: ODST and then in Halo: Reach. To me, this is a fair trade. While I like the idea of fighting continuous waves of enemies when the chances of surviving get slimmer and slimmer, there is something very nice about having a story to go along with it and that’s what Spartan Ops does. Like its bigger and more elaborate campaign counterpart, the Spartan Ops can be played with four players cooperatively. Available since launch day, Spartan Ops allowed players to experience the Covenant and Promethean threat from the eyes off the new Spartan-IVs that were present throughout Halo 4. Unlike the mainline campaign, the Ops are divided into Episodes which are then further divided into Chapters. Each episode is comprised of five chapters which can range in length of time depending on player skill levels and if they want to tackle them solo or with a full squad. The actual mission play in the ops aren’t bad, though if you want to know what’s going on, I’d recommend muting your friends for a bit or finding quiet ones. Most of the plot driving in the missions are given to you by characters in a view screen on the HUD where Cortana usually resides or piping through your speakers with audio. While this isn’t bad, it is easy to not know exactly why you’re killing an entire valley of snarling Covenant that are more than happy to rip you limb from limb. Couple this with a very recycled set of environments to play through, and you walk away feeling so-so. Thankfully, 343 has promised more to come as the Spartan Ops story is far from over. Accompanying each chapter is a short cinematic to set the tone of the gameplay that follows. Those looking for the Chief to be hogging the spotlight will be slightly disappointed. Instead, the cinematics follow the ship UNSC Infinity and its Captain, Thomas Lasky, as well as its crew of Spartan-IVs commanded by Spartan Sarah Palmer, voiced by Jennifer Hale (Star Wars: KTOR I and II, Mass Effect). Just as beautifully rendered as the full campaign, the cinematics set a very dramatic tone which will be key for the rest of the Spartan Ops episodes as well as the Halo sequels that are sure to follow. My grade: Play it! If you’re a fan of the fiction that Halo provides, you need to play these Ops! Some of you may be thinking, “Is this it?” For now, yes it is. I could talk your ears of about this game, but that time should be better spent playing the game for yourself and seeing that I haven’t lied to you about how awesome this game really is. My grade: It’s a game you shouldn’t miss. It belongs in the library of gaming eternity.